For the AI counterpart, see Bloat (Killing Floor 2). The player-controlled Bloat is one of the playable ZEDs in Killing Floor 2's Versus Mode. The Bloat is a high health, extremely resistant and slowly moving tank of the ZED team, it's main role is to charge through the Survivor's positions in order to damage them and obscure their vision with the bloat bile. Additionally, Bloat works well as an area denial unit thanks to its ability to lay down puke mines. 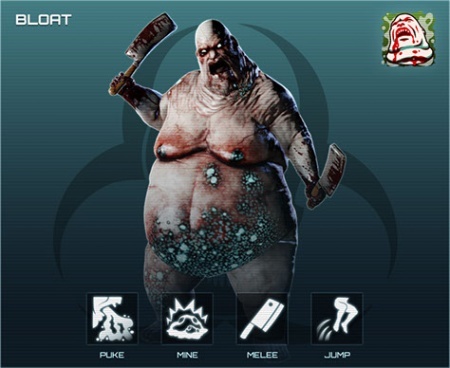 Due to Game Conductor mechanics, player-controlled Bloats have their health modified based on the average level of the Survivor team. Values vary within (x0.85 - x2) range. Player-controlled Bloats have a wide variety of damage type resistances as well as some notable weaknesses. They are also less resistant to damage from certain tier 1 weapons. Bloats are weak against microwave, neutral to fire and are significantly resistant to other damage types. Bloats resist to every type of ballistic weaponry but most notably weak against SMGs and assault rifles and are resistant against shotgun damage. Bloats are extremely vulnerable against Firebug's Caulk n' Burn and heavy (blunt) attacks of Berserker's Crovel Survival Tool. They also have different multipliers against Eviscerator's projectile and melee attacks. Bloats are significantly vulnerable against certain handguns. Bloats have only one weak spot, which is the head. Although the damage multiplier is miserable. Their meat cleavers deflect attacks. Primary: Puke attack that damages Survivors and distracts their vision. Secondary: Puke mine that explodes when Survivor's within its proximity. Bash: A single slash with the meat cleaver. Bash + Jump: Belly slam. Block. Damage multiplier (firearms) - x0.3, Damage multiplier (melee) - x0.3. Cooldown - 0.5s. Melee. Damage - 20. Maximum hit range - 2.5m. Cooldown - 0.5s. Mine. Damage - 15. Radius - 4.5m. No falloff. Health - 100. Explodes after 300s. Cooldown - 1.55s. Vomit. Damage - 20. Maximum hit range - 3.5m. Cooldown - 1.25s. Note: Maximum mines allowed - 30. Melee attack (jumping) - x1. Melee attack (running) - x0.6. Melee attack (walking / stationary) - x1. Vomit attack perform multiple hits: normal puke and lunge puke - 2 hits per attack, 360 puke (while moving backward) - 4 hits per attack. ump cooldown - 1.5s. Mine explosion triggers: radius - 60 units, height - 22 units. Puke mine travel speed = 1000 units per second. Player-controlled Bloats start spawning at the second wave of the normal versus game. On top of their high health and damage resistance Bloats are capable of mitigating damage by blocking which makes them even more tougher.